Last year I was working in a building in New Westminster with a window that overlooked the railway crossing at Front Street. There, I witnessed the passing of trains and truck traffic on a daily basis. I still remember wanting to close the window every time I opened it to enjoy the fresh air, because the air smelled like diesel. It just wasn’t something I wanted to breathe, and I kept that window closed as much as I can for the duration of my stay. According to Councillor Bill Harper, Front Street is one of the “most toxic” areas in the Lower Mainland in terms of air quality. 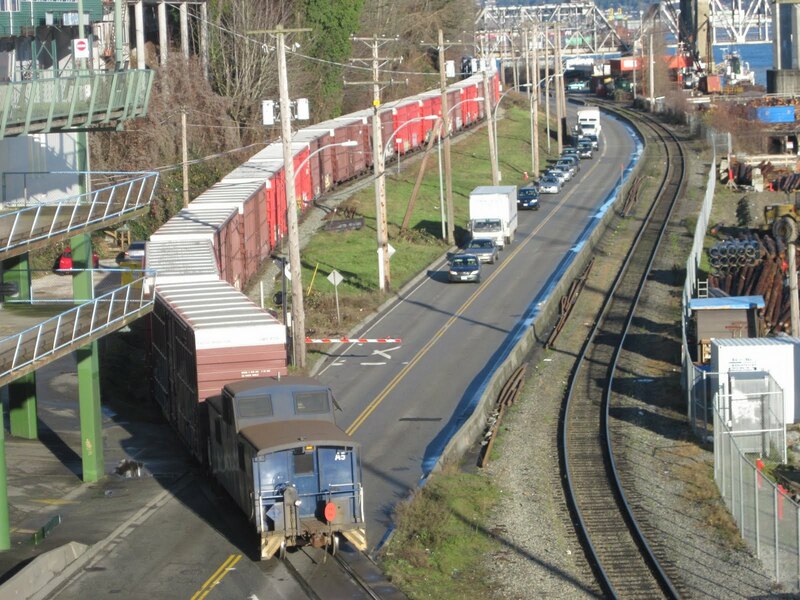 Trucks that use Front Street, as they do regularly with Columbia Street not being suitable for large amounts of trucks, have to contend with these trains, which slowly continue onto the Fraser River Bridge into Surrey. As well, New Westminster residents have to contend with the train whistles, and the air pollution resulting from the stop and go movement. On a transportation basis, it’s not efficient and not predictable to use front street. This is where a new six-lane Pattullo bridge replacement – which I discussed in a previous blog article and through letters now published in three Burnaby and New Westminster newspapers – can most handily come in. 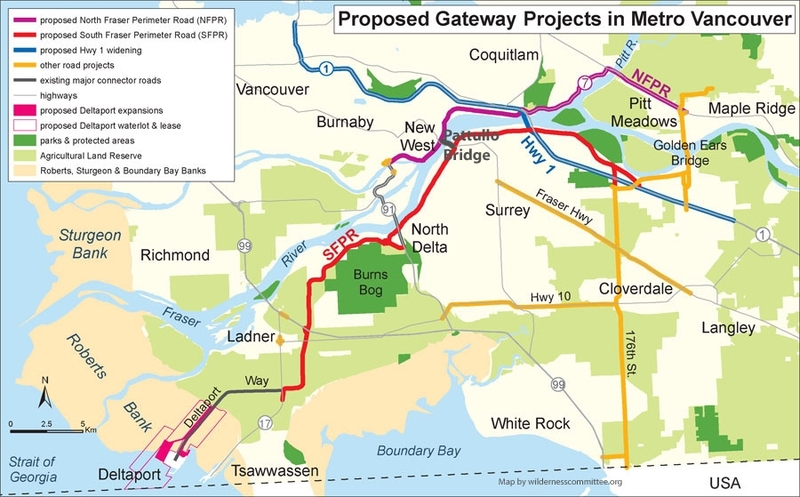 This summary map shows the highway projects that were proposed with the Gateway Program (along with other recent major road projects in the region). The previously proposed NFPR is highlighted in purple. The Front Street corridor was part of a previous highway proposal called the North Fraser Perimeter Road (NFPR), which was part of the regional Gateway Program. 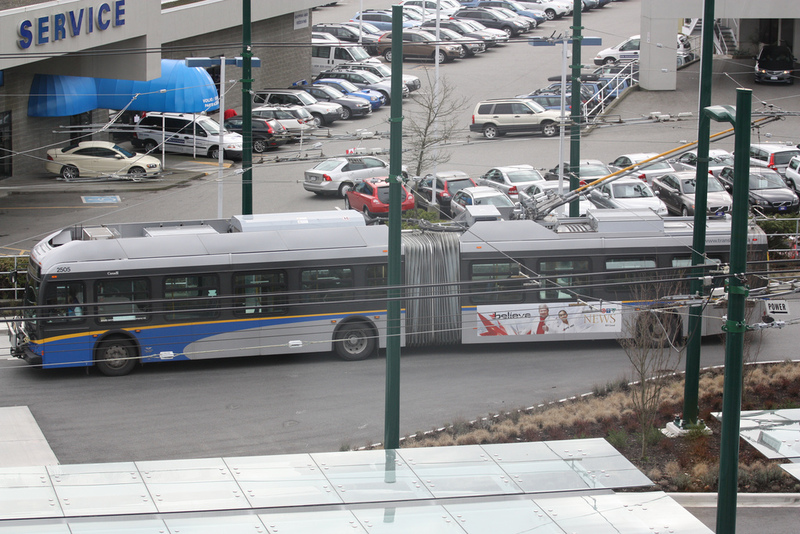 However, both New Westminster and TransLink have placed this project on the backburner, perhaps indefinitely. Plans for a new Pattullo Bridge no longer show a connection with Front Street, and the United Boulevard Extension is off the table. Instead, the City of New Westminster has discussed the potential to revitalize Front Street into a “neighbourhood street” lined with business and mixed-use development, deconstructing it as the current through route for many trucks travelling from the southwest to the northeast. 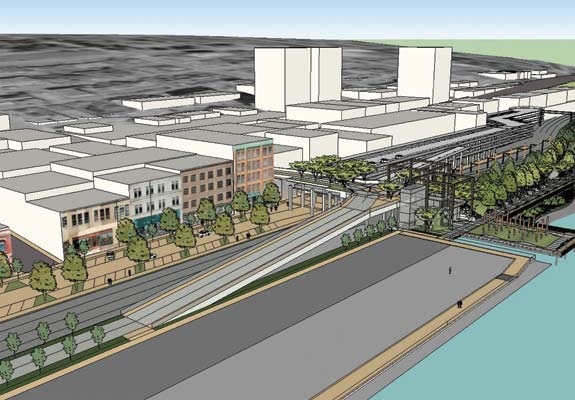 The revitalized Front Street concept included a car, bike and pedestrian overpass at Sixth Street, connecting with the new Waterfront Park, to eliminate the railway crossing at Eight Street and – along with the elimination of the Front Street crossing and the closure of Front Street as a through route – result in the elimination of all railway crossings in New Westminster, and associated train whistle habits. As a proponent of sustainable urban development and a nearby resident just 10 minutes away by SkyTrain in Burnaby, a revitalized Front Street is something I really look forward to. It has the potential to bring increased business, quality of life and tourism to New Westminster, benefitting everyone in the big picture. Already, new investments into the community like the Waterfront Park have greatly improved the quality of life in New Westminster, and have given people across the region more reasons to come into New Westminster. More than ever, New Westminster is an accessible, vibrant regional centre – and I think that planners and decision makers should be building on that momentum that started with first steps like Plaza 88 at New Westminster Station and the under construction civic centre across the street. However, the construction of a six-lane Pattullo Bridge with extra capacity to redirect traffic is the only way the City of New Westminster can realistically follow through with this priority. While the City has discussed redirecting trucks onto alternate parallel corridors like 10th and Royal Avenues, neither are very suitable for trucks. The former is a two-lane, low-capacity corridor for much of its length not suitable for schedule-oriented goods movement. The latter puts trucks through a climb on a very steep hill, which apart from being an issue for truckers themselves, creates noise and pollution for New Westminster residents. The issues with 10th and Royal were being discussed in detail in New Westminster’s official downtown community plan. However, these discussions seem to have been ignored in more recent viewpoint establishments. It remains a fact that the South Fraser Perimeter Road (SFPR) with an expanded Pattullo Bridge can fulfill a role that Front Street currently dominates: getting trucks and goods from the South-of-Fraser ports in Delta to Northeast sector ports and industrial centres. A six-lane Pattullo Bridge is the only way to facilitate a direct connection between the SFPR and Columbia Street and totally replace Front Street as well as the heavily congested Queensborough Bridge in this segment with a reliable alternative. I think the City of New Westminster could be taking this into account in having a position on a Pattullo Bridge replacement. Being open to six lanes, the possibilities with Front Street would be endless. New Westminster’s Jim Lowrie told us that a six-lane Pattullo would cost about twice as much as a four-lane bridge, but the released study reports an entirely different number. Given the actual premium for two extra lanes stands at a more reasonable $200 to $300 million, I am in favour of a six-lane bridge. Before anyone complains, I think it’s important to establish first what exactly the extra lanes will be for, where will they go, and what are the benefits. 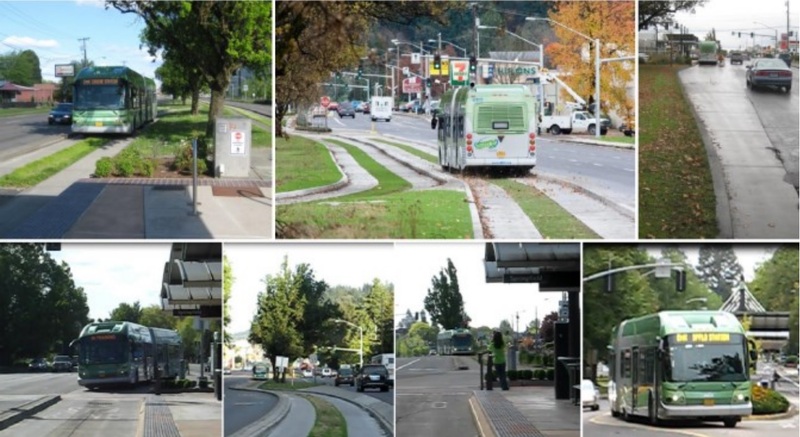 I have heard some complaints about how McBride would become a “six-lane expressway” and overload New Westminster and Burnaby streets with traffic. But TransLink’s concepts from last year’s consultations show that the third lane is intended to split off towards Columbia Street north of the bridge – a road leading away from New Westminster….